The What: IHSE USA has launched a new line of extenders that allows broadcast SDI formats to be converted and switched within any IHSE KVM matrix switch. The new Draco vario SDI series accepts SDI signal formats up to 3G-SDI. From there, the extenders allow source and destination extensions up to 10 kilometers over single-mode fiber, making it possible to extend high-resolution computer-based content to or from broadcast serial digital equipment. The What Else: The Draco vario SDI extender comes in two models: a CPU (TX) model and a CON (RX) model, both of which support pluggable SFP modules for SDI fiber, SDI coax, or a combination of both. A signal-conversion function inside the CPU extender converts SDI input sources to a proprietary transport for use with IHSE's flex-port technology. Once connected to an IHSE matrix switch, the signal can then be used to switch converted SDI from the CPU to function with other extenders connected to the matrix. This capability allows users to view content on a wide range of monitors without needing dedicated SDI displays and extra cables for SDI extension. Conversely, from the matrix switch, signals initiated from an IHSE HDMI or DVI extender can be routed to the SDI CON unit for conversion to a compliant SMPTE SDI output. The vario SDI extender is compatible with the vario enclosures for two-bay, four-bay, six-bay, and 21-bay applications. It is useful in simple point-to-point applications or in combination with the Draco tera compact or Draco tera enterprise matrix switches. Other features include redundant flex-port connections for applications such as primary/secondary path management, bypass-signal management during 24/7 operations, and dual-path signal management for multiswitch connectivity. "Broadcast and postproduction firms are always looking for a better way to simplify the sharing of serial digital and computer video sources, and these new vario SDI extenders easily solve this problem," said Dan Holland, marketing manager for IHSE USA. "Postproduction and video editing technicians will find these to be simple, cost-effective devices for video-distribution paths between computers and HD-SDI video broadcast gear." 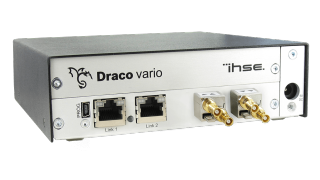 The Bottom Line: The Draco vario models are designed to function with IHSE's Draco tera compact or Draco tera enterprise matrix switch solutions to distribute SDI video in parallel with the company's standard KVM extenders. The vario SDI extender supports video resolutions up to 1080p60 via an SFP module available in either HD-BNC for coax or duplex LC for fiber. In addition, the units support SDI with embedded audio via the SMPTE ST-259, ST-292, and ST-424 serial digital standards.